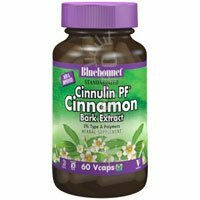 Bluebonnet's Cinnulin PF® Cinnamon Bark Extract Vcaps contain a formula that combines a patented water extracted cinnamon bark (250 mg), which provides a high concentration of active type-A polyphenol polymers with sterilized whole raw herb (200 mg). Plus, the easy-to-swallow vegetable capsules contain FruitO2X®, a special antioxidant blend of high ORAC* fruit extracts standardized for their polyphenol content, which stabilizes, protects and preserves the formula's sensitive active constituents in the extract and whole raw herb. ? Cinnulin PF® is a registered trademark of Integrity Nutraceuticals. FruitO2X® is a registered trademark of Bluebonnet Nutrition Corporation. Do not copy Other ingredients: 100% Kosher vegetable capsules, Fruit02X® fruit extracts and concentrated powders (wild blueberry, cranberry, prune, cherry and bilberry fruits, grape seed, raspberry seed), vegetable cellulose, vegetable magnesium stearate. Free of milk, egg, fish, crustacean shellfish, tree nuts, peanuts, wheat and soybeans. Also free of corn, yeast, gluten, barley, rice, sodium and sugar. If you have any questions about this product by Bluebonnet, contact us by completing and submitting the form below. If you are looking for a specif part number, please include it with your message.